Can You Hear Me Now? Can You See Me Through the Clouds? The advent of video conferencing, adoption of softphones and cloud-based UC services is creating dramatic and exciting developments in unified communications technologies and capabilities. Products such as Microsoft Skype for Business and Cisco Spark are disrupting the industry with the easy-to-use, all-in-one applications that allow users to communicate however and wherever they want. Cloud is another disruptive and rapidly growing technology. The use of public cloud services (SaaS, PaaS and IaaS) has been growing by leaps and bounds. Gartner estimates it will grow 22.3% annually between 2014 and 2019. EMA’s recent Network Management Megatrends 2016 report shows that 41% of all network traffic originates from external cloud applications and 90% of enterprises have either deployed or plan to deploy hybrid cloud deployment within the next two years. In order to successfully navigate these sometimes confusing and complicated challenges, it helps to have complete and unified visibility—for planning purposes, to proactively monitor performance, and to quickly troubleshoot issues—in and out of the cloud. 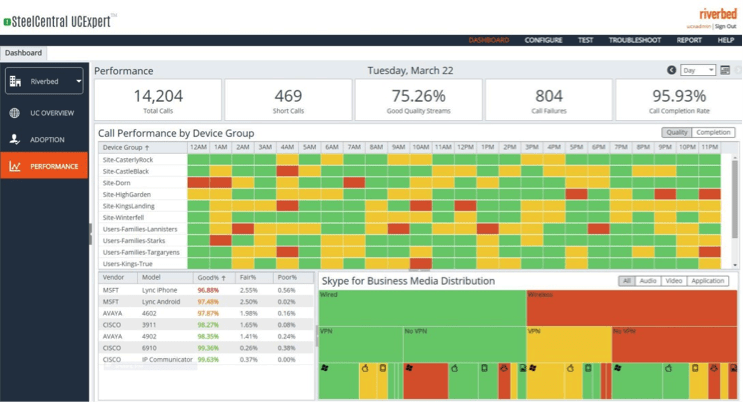 The new release of SteelCentral, the Command Center for Application Performance, delivers significant new enhancements in cloud-based performance monitoring, along with new capabilities in unified communications visibility and changes to how we monitor virtualized server environments, among other enhancements. These enhancements continue to support a common theme of improved SteelCentral platform integration and next-generation diagnostics and troubleshooting. With SteelCentral AppInternals, you can now automatically scale monitoring across applications that leverage cloud services and related technologies like PaaS, containers and micro-services so you can visualize application behavior in real time to more quickly troubleshoot issues or to proactively improve performance. As these environments dynamically scale during peak periods, the elastic and ephemeral nature of cloud applications means conventional performance monitoring tools that trace interactions between servers cannot coherently represent application behavior. The new Application Performance Graph visually maps the logical components of the applications—the interactions between application modules—in real-time, regardless of the underlying infrastructure. This reveals dependencies and hotspots obscured by the complexity of the environment so that you can observe and fix the issues with the greatest impact. Additionally, this release introduces out-of-the-box monitoring for applications deployed on Microsoft Azure Cloud Services, and will also be conveniently offered on the Amazon Web Services (AWS) Marketplace for AWS customers. Unified communications is a complex set of applications typically consisting of voice and video communications, file/application sharing, presence, collaboration, and instant messaging. As the complexity of these UC applications increases, so does the management challenges. Now the data network, desktop support, Windows server and voice groups need to work collaboratively to ensure high-quality service and effectively troubleshoot user issues. Problem areas that used to be isolated to dedicated desk phones and PBXs are now significantly broader and can be caused by the shared data network, PC, mobile device, application servers, or even common user mistakes such as failing to use the provided headset. Identifying the root cause of UC quality issues is often a difficult, time-consuming and thankless task. The new release of SteelCentral UCExpert adds support for Microsoft Skype for Business and a redesigned UI, providing a multi-vendor, multi-tenant dashboard so you can monitor your Microsoft, Cisco and Avaya UC performance in a single glance using common language and common troubleshooting workflows. It provides rich information about usage and adoption as well as call performance, and allows you to troubleshoot performance problems across all three vendors simultaneously with zero need to train on different tools or vendor terminology. In addition, UC performance metrics are now blended in SteelCentral Portal with network, application and infrastructure data from other SteelCentral solutions for a unified and holistic view of performance for your entire environment. So, yes, unified communications and cloud might be two technologies that are keeping you up nights, but we heard you and we responded with two of the most innovative and comprehensive monitoring solutions available today. To learn more, visit https://www.riverbed.com/commandcenter.